Syrian President Bashar al-Assad’s forces this week destroyed one more distinct monument at a UNESCO World Heritage site. The monument -- known as a kalybe or open-air temple for the “Cradle of the King’s Daughter” -- is in Bosra ash-Sham, once an ancient city in southern Syria. Bosra ash-Sham is 120 kilometers from Damascus and part of Deraa province. It counted a population of 19,683 in a 2004 census. The current figure is down to a few households. Indiscriminate tank shelling and warplane bombing has also pulverized the “Cradle of the King’s Daughter” dating back some 1,800 years. The human cost of Assad’s 19-month-old war on “terrorist gangs” has been staggering: at least 38,000 deaths (over 60 percent of them in the past five months), tens of thousands more maimed, detained or missing, over half-a-million refugees, and 1.5 million internally displaced persons (IDPs). For several months now, the regime has been using mostly helicopters and warplanes to drop cluster bombs and barrels of TNT on homes, hospitals, pharmacies, schools, historic sites, medieval markets, museums, mosques, cars, bakeries and fuel queues in countless cities, towns and villages. In late September, a vast and well-preserved labyrinth of shops, storehouses, schools and courtyards in Aleppo's ancient market were set on fire as government troops tried to dislodge insurgents from the center of Aleppo near the old city, another The old city, with the souk at its center, is the soul of Aleppo, one of the world’s oldest continuously inhabited cities and Syria’s largest. (See “Cuba, Baghdad and turning Aleppo to rubble and ash”). Two weeks later, Aleppo's Umayyad Mosque, considered one of the most stunning in the world, was also damaged in fighting for control of the city. “The reports from Aleppo are deeply distressing,” said UNESCO Director-General Irina Bokova. “The human suffering caused by this situation is already extreme. 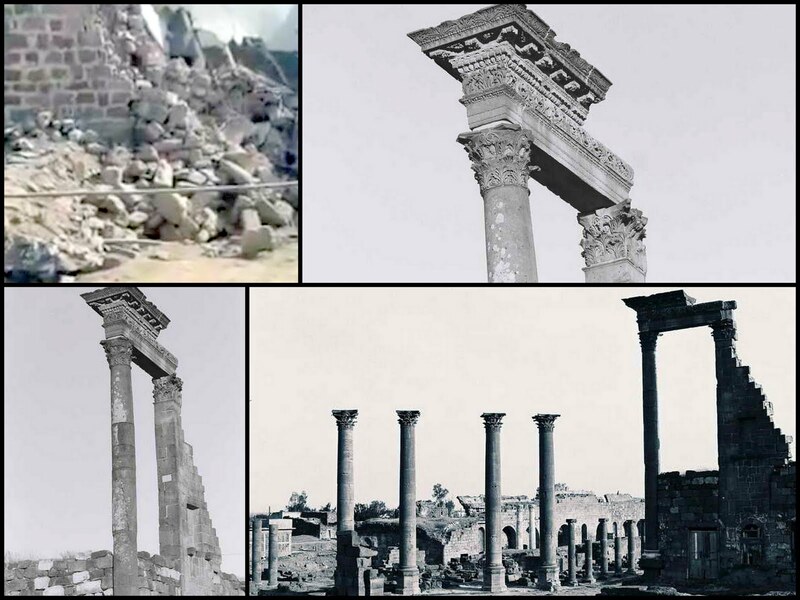 That the fighting is now destroying cultural heritage that bears witness to the country’s millenary history -- valued and admired the world over -- makes it even more tragic. The Ancient City of Aleppo was inscribed on UNESCO’s World Heritage List in 1986, in recognition of its “rare and authentic Arab architectural styles” and its testimony to the city's cultural, social, and technological development from the Mamlouk period. It is one of six Syrian World Heritage Sites. UNESCO listed the Ancient City of Bosra -- home to the “Cradle of the King’s Daughter” -- as a World Heritage site six years earlier, in 1980. Bosra ash-Sham was the first Nabatean city in the 2nd century BC. It was renamed Nova Trajana Bostra under the Roman Empire. The city flourished and became a major metropolis at the juncture of several trade routes, including the Roman road to the Red Sea. The Sassanid Persians conquered Bosra in the early 7th century, then the Byzantines. The Rashidun army under Khalid ibn al-Walid (who is buried in Homs) captured the city in the Battle of Bosra (634). Bosra played an important part in the early life of Prophet Muhammad (PBUH). According to Islamic tradition, when Muhammad was either nine or twelve years old, he met a Christian Nestorian monk named Bahira in Bosra during his travel with a Meccan caravan, accompanying his uncle Abu Talib ibn ‘Abd al-Muttalib. When the caravan was passing by his hermitage, the monk invited the merchants to a meal. They accepted the invitation, leaving the boy to guard the camels. Bahira, however, insisted that everyone in the caravan should come to him. Then a miraculous incident indicated to the monk that Muhammad was destined to become a prophet. According to legend, an unnamed monarch built the open-air temple with a cradle for his daughter around the second century after being told by a clairvoyant she would die before turning 18 from a poisonous scorpion sting. Once the cradle was built to protect her, slaves would carry food and everything else she needed up the columns. After a while, a deadly scorpion hiding in a bunch of grapes stung and killed her. Assad shells and bombings have this week put the cradle six feet under.